Is this awesome or what? This is something that is perfect to hold both my bracelets and watches. Now I can find the one I want to wear easily and when I put it back it looks so nice on it's own little pillow. Love this, so easy to use, has a clasp closing, each firm pillow comes out and goes back in. What a wonderful way to organize or show off your watches. Would even be great in a pawn shop, or any other store that sells watches or bracelets. Easy to pack up and move to your next sale. You can find the Ohuhu Jewelry case on Amazon. 12-Slot Leather Watch Box / Watch Case / Jewelry Box /Watch Jewelry Display Storage with Glass Top and 12 Removal Storage Pillows, Black - Ideal Gift. 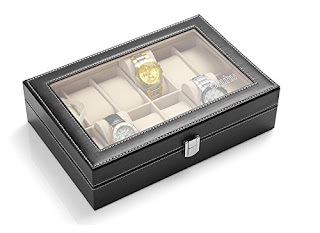 Keep your jewelry and watches tidy and organized with this stylish Storage Display Case. 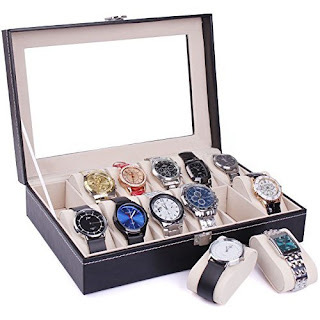 It includes soft removable pillows to keep your watch or bracelet in an upright position to avoid scratches while moving the display case around. The lid features a clear glass to enable easy viewing of the watches inside, which is perfect for both personal use and business use.